Очень приятная прогулка на теплоходе. Фейерверк неплохой, но может неповезти с погодой. Есть один недостаток - много людей. Прогулка весьма популярная, поэтому немного тесновато. What if you want to have the most romantic, memorable, and unforgettable experience in Seoul? 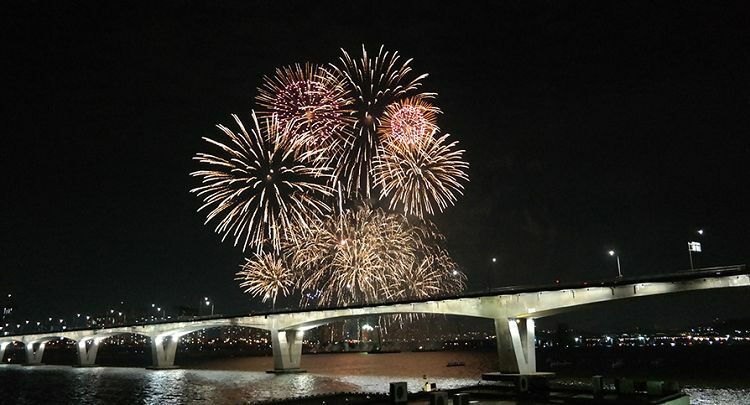 We recommend you to enjoy the day or night views and scenery of Han River, a center of Seoul. Leave fantastic memories with your loved ones watching the scenery of Han River and Seoul under the blue sky by day and the Rainbow-colored Fountain Show by night. Departing from Yeouido, the cruise passes 63 Square, Namsan Tower, Banpo Bridge, or the National Assembly and Yanghwa Bridge. Give seagulls some snacks and dance to live music on board! E-land will make you a memorable experience of Seoul. • Give seagulls, flying under the blue sky, some snacks! • Enjoy the wonderful night views of the Han River and Seoul! • Live JAZZ Performance will make your day great. 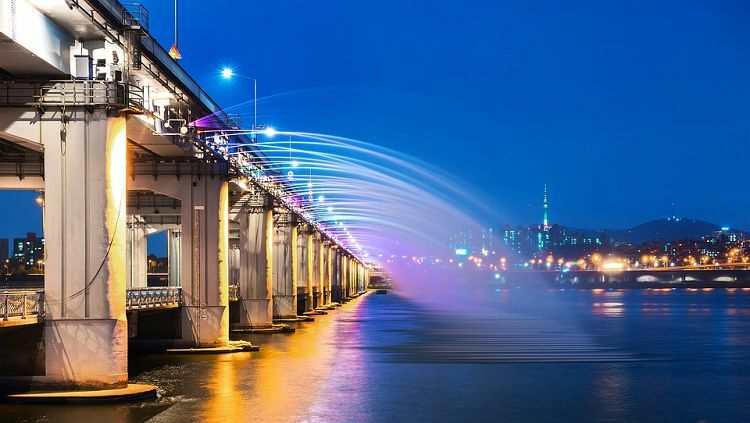 • Enjoy the beautiful Banpo Bridge Moonlight Rainbow Fountain! Romantic Cruise with the story and nature! You can enjoy the fresh air and wide-open space on the Han River with your family, lover, or friends. Story Cruise is a tour cruise that you can meet the various ecosystems around you crossing under the brides around Han River. - Enjoy the view of Seoul around Han river during the bright day. "Love, Moonlight, and Bloom." Moonlight Cruise on Han River offers a beautiful night view of Seoul. 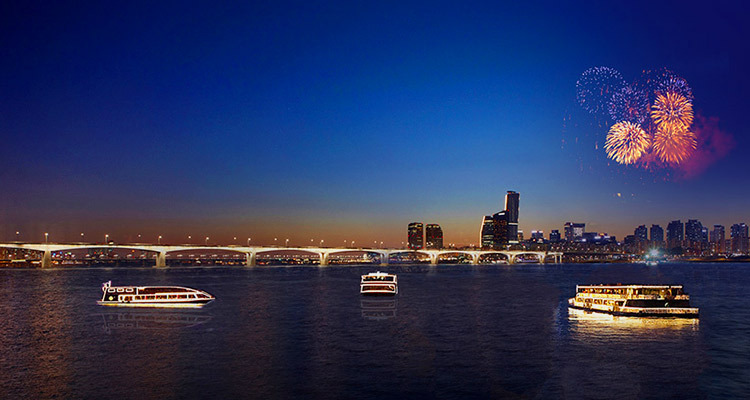 There will be a Live Music Performance provided with unforgettable night view on board. - Enjoy the National Assembly and Yeouido that bright more at night. - Enjoy the night view of 63 Square, N Seoul Tower, Wonhyo Bridge, Mapo Bridge, Dangsan Railway Bridge. - Enjoy romantic Live Music Performance with the night view. Music Cruise is the most romantic cruise, which you can enjoy the night view of Seoul and beautiful Rainbow Fountain Show of Banpo Bridge. - Enjoy the night view of 63 Square, N Seoul Tower, Wonhyo Bridge, Mapo Bridge. - Enjoy Banpo Bridge Moonlight Rainbow Fountain closely. - Take photos at various photo zones near the docks! Spend a romantic night watching fireworks on board only once a week, Saturday. It is the perfect place to confess your feelings to someone you love on board. - Enjoy romantic fireworks on board. - Enjoy the night view of 63 Square, N Seoul Tower, Wonhyo Bridge, Banpo Bridge. 1. Reserve and purchase the desired cruise option and Check mobile voucher or email voucher. 2. Arrive E-land Cruise Ticket Office 10 minutes before the reservation time on the day of reservation. 3. Present the voucher at the ticket office and fill out the boarding report. 4. Board on E-land Cruise! • Location of Ticket Office: Get off of Exit 3 of Yeouinaru Station (Subway line 5) and go down to the Han River Park → Ticket office is located on the stairs before the dock. ※ Please refer to the below picture of E-land Cruise Dock. 1. You must bring your passport with you. 2. If your reservation cannot be made at a desired date and time, our CS Team will contact you via email. 3. Cruise operation dates may vary / be canceled depending on the cruise or weather conditions. In this case, our CS Team will contact you via email. 4. Please go to the E-land Ticket Office and fill out the boarding report first, not the cruise! 5. Banpo Bridge Moonlight Rainbow Fountain Show is operated only from April to October. It can be canceled due to bad weather or Seoul City conditions without prior notice. 6. There is no Story Cruise performance at 11:30 on weekend and holiday. Q. I want to see Banpo Bridge Moonlight Rainbow Fountain Show. Which cruise should I take? A. You can watch Banpo Bridge Moonlight Rainbow Fountain Show on Music Cruise or Fireworks Cruise.